yeah I raced the 340 and a couple other races but I by no means know anything about the racing world. And for my purposes, lets limit this discussion to canoes, and without starting another argument, let's define it as pertaining it to solo boats paddled with a single blade paddle. I say that because I do not double blade. Pretty much all there is to it. And I don't expect to win any races, but my friends will tell you I still have a competetive streak within me. I think you should start with boats such as the Bell Magic, the Advantage, the Voyager. Open conventional boats. I am a little familiar with those. Fast boats more than adequate for the 340. Wouldn't be ashamed at entering the race in any of them. I know more about the Expedition canoes...Sawyer Loon, Mad River Monarch, Kruger Sea Wind. I own one of each. I personally think they are awesome! Comfortable, stable and fast. Makes for a happy racer and a decent race. Not going to win a race in these boats but you can be a happy, dry, and reasonably fast solo racer single blading one of these boats. Even rookies like me can make them go fast in a straight line because they have a rudder. As novice as I am, I do understand there are other fast "canoes"out there. Hellbender has a Sawyer Shockwave, and I admit I'm developing an increasing interest in that boat as a step up, a step faster, than my expedition canoes. Perhaps a little less stable, but still an awesome craft to enter an expedition race with. And his has a rudder. Very cool, and camo to boot. But, there are other solo race canoes out there. The old Jensens? Grasse River boats? How do they rate? Where do they rate in this continuum? 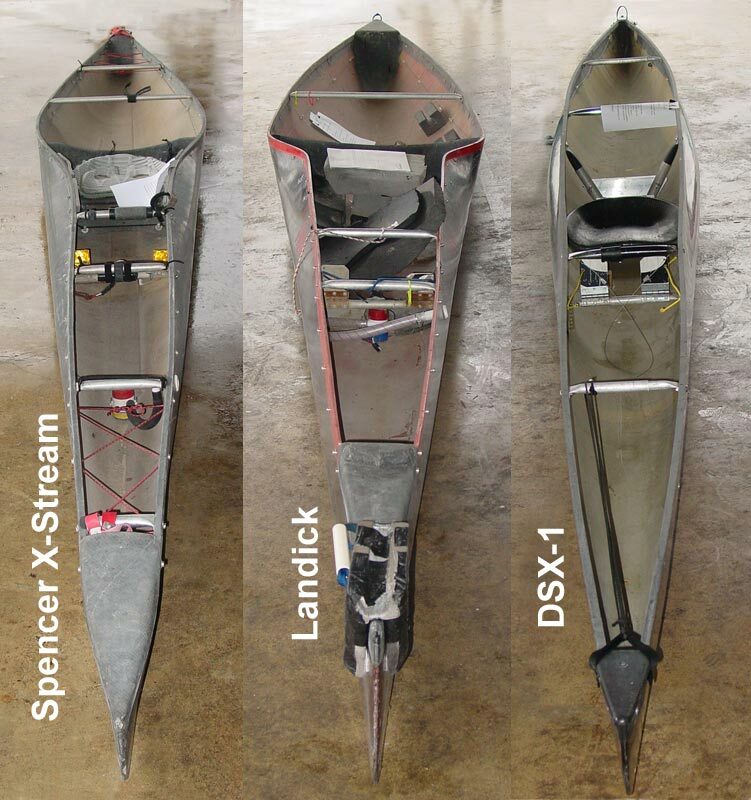 In my ignorance, I think a Spencer Extreme, a Crozier, or a Landick 2, all equipped with a rudder, would be the next step in speed, up from the Expedition canoes? The Shockwave in between? So let's say a guy wants to go faster in a "canoe", single blade and with a rudder. What are the steps, from stable and novice oriented, to faster and faster and more "pro"? Don't tell me to get a sea kayak or a surfski. That is not my question. I'm not racing those guys and gals. As most know I love the outrigger canoe.. very fast and very stable.. great access to the water on every stroke.. plus you can move around a little..
the fastest boat is the one you can paddle for 340 miles and be comfortable enough to finish in it.. or maybe can handle the pain in for 340 miles might be a better way to say it..
Ok, my two centavos FWIW. I do not have any experience in the safari rigs, so I am not sure where they fit in. Also, these are sans rudder...not that there is anything wrong with that. 1. USCA C1 - these depend on weight of the paddler. This is for my weight, approx. 175 to 180 pounds. *I think that it would be tough to do the 340 in one of these boats though. Doable, but hard. For a 340 boat, I would take #1 (all letters) and #4 out. Further, a lighter boat will generally be quicker. The Blackwater and the Classic XL can be made much lighter than the other boats on the list. Additionally, Like I said, I am not sure where the unlimited C1 canoes fit into this list (when paddled with a single). Also, I am guessing that the expedition canoes slot in somewhere right around 7 give or take 1. They would be higher, but they are built heavier for strength not speed (albeit many are plenty quick). Texas Boats - A book could be written on them, and Erin Magee or West Hansen could tell you all about this. I am going to skip to the relevant information for this thread, and since I have owned 3, and still own 2, and I lived there for 3 years, I'll chime in. Texas boats started being built in the 80's/90's, they are a hybrid generally of canoes and kayaks. Built to be tough, but light. Some are more of a canoe hybrid, and some are more of a kayak hybrid. In order from fastest to slowest, Let's pick a few models of texas boats. They all have rudders, and they all are made with the idea that you can single AND double. More for kayaking: Eagle and Extreme. In my Eagle, you would be hard pressed to single because I dropped the seat in order to have a better kayak stroke. The original seat was higher, and it was a little tippy in that seat. The Extreme can be singled a little better, but you are better off kayaking it. More for Single Blading: On the other side of the spectrum, the Landick II and the DSX are more "comfortable boats" but still plenty fast. If you want a fast TX boat that you can double or single, but primarily single, take one of those. Many people have won the TWS in one of those. The perfect combination: My personal favorite is the Rainmaker. I used to own one. Deron Sugg (3x MR340 finisher, St. Louis resident) owns it now. It is the perfect boat in my opinion for the MR340. I raced it my 2nd year and got 49 hours when I was still a novice and wasn't sure what I was doing. Andrew Condie raced in a Rainmaker in 2010 and overtook me in my surfski around Glascow. 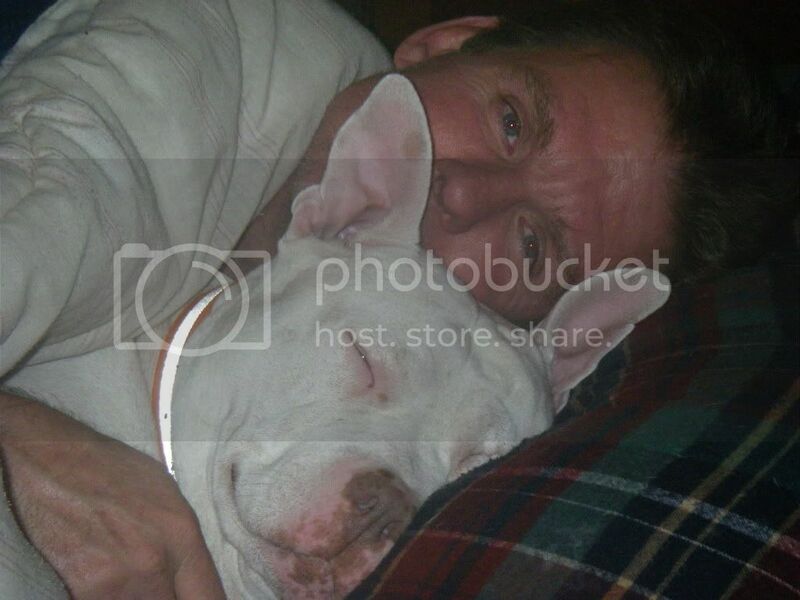 He remained in the lead until falling sick at Herman. I remember seeing a boat creep up on my side, and I looked over and he was just single blading along. Kicking some major @$$. I was double blading but was recovering a little from going hot for the first 120 miles. It was at that moment I realized the beauty of single blading. The first four years I double bladed this race. Then I single bladed the safari last year with Wally (Los Humongos) and tried to learn as much as I could from him. Then I single bladed with Slebos last year in the 340. I will never race the 340 again on a double blade only. I'd prefer to be able to switch out, but if I had to choose one, I'd choose single. Doubling hard forever is hard unless you are Carter Johnson. Apparantly Santo and Chuck like that too, but I have seen the light. If you want a great boat that is pretty good at everything, pretty stable, and pretty fast, get a rainmaker. Oh, did I mention the Rainmaker I owned is the same boat that West Hansen used to win the 2001 solo class in the Safari? Yeah, the Rainmaker is a great boat. 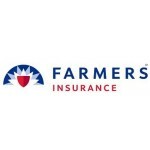 Your #1 Site for Canoe and Kayak Racing In the Midwest!! How about a pic of the Rainmaker in the same perspective as the other three boats so we can get an idea of hull shape? Any spects on length and 3" or 4" water line width? Joe - Rent DI's Spencer Eagle for the summer (I would like to demo it!). RE my limited experence in C1'- like you I am not nterested in super tippy boats that the real athletes like to paddle. -I feel that for the 340 venue the SW lower sides are less affected by the winds than the advantage or voyager. For that reason I feel its a little faster for me. Plus it was a custom build at about the same price as mass produced wenonahs. I know the shockwave hull is old school compared to much racier c1's today but I like the stability and I need a boat that I can occasionally semi kneel in to relieve pressure on back and hips. My next C1 is going to be a erg : ) !! Or actually my current dreamboat would be light weight Shockwave in carbon or kevlar semi decked 1/3 of the way bow and stern with large hatches. Expedition style (Kruger like) seating with rudder set up that can be steered by knee or foot. I a just waiting for Scott Smith to get his new bagging equipment to commission the build! I build a boat called the Hawk that is faster than any of the boats above. it is tippy though. less tippy than the eagle or dsx and more than the others but a lot faster. I am in the process of finishing a 16 inch version with a 13 inch water line. the normal specs are 21ft long, 13.5 waterline and 17inches wide with a 14 ft flat spot for stability. built at 19 to 26 lbs. 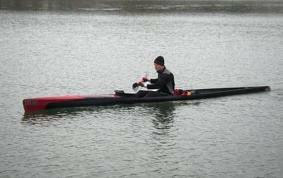 Here's a pic of me in my Rainmaker on town lake in January 2009. Sorry it's the only pic I've got right now. The specs are 20' x 18". Waterline is probably 17.5. It has a pretty flat bottom, so lots of stability. "Over 5 flat miles in same conditions 3 separate days (5 miles is not considered an ideal test for distance - but it is considered a good test for stability at 95%of hrm max on flat water). Extreme, Landick II - top end speed on flat lake with .5mph current per speedometer for water reading......7.75mph. top end speed Rainmaker same conditions, paddler, venue - 7.95mph. Marginal speed increase not considered to be factor in choosing hull for preference by test paddler." I think the Extreme is a really good 340 boat. Similar waterline as a surfski when you're cruising straight line. But nice wide flare for when you get into rough water or you're having trouble night two. Easily singled. Watch Bret Still paddle his. This is the boat I own. Never flipped over on me. In fact, I can lean it to the point where water starts to pour in and it still doesn't flip. If you find a used one, they are easy to rehab. The craftsmanship is generally very good. Glenn Phaup won men's solo last year in an extreme. Check the brand new Guinness book of world records in your local bookstore. Katie Pfefferkorn has her picture on page 121 paddling an extreme on her record setting run. She owns a DSX but swears by the Extreme for long distance. This is a great thread. I'd like to hear more from the outrigger folks. Any comparison as to which OC1 considered "fastest"
There's a lot to be said for a little extra stability in an ultra marathon. Glenn beat some pretty heavy hitters in his Extreme this year. More than one of the guys he beat probably wished for the stability of an Extreme or outrigger at some point in their race. 1)Va'as or ruddered va'as. But good luck finding one in the states, they are more common in New Zealand and the Pacific Islands. They are super skinny, long and have very little rocker. 2) Flatwater OC1s such as the savage river surfrigger, wenonah javelin, c-lion. These tend to be long narrow and have little rocker. Usually just enough rocker to tolerate rough water. The c-lion is still being made and maybe others. 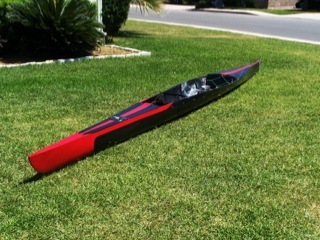 3) Flat ocean OC1s such as the huki v1x, hurricane, etc. These have more rocker, enough to surf smallish waves and are common in ocean racing. A bunch of these are currently being made. 4) Ocean (surfing) OC1s. these are the most common and not really intended for flatwater paddling although they might still get you to st charles faster than a c1? Relative speed between catagories....as always subjective....I had a hurricane (which is regarded as one of the faster flat ocean oc1s and a wenonah javelin (flatwater oc1). The javelin is a much faster looking boat but only moderately faster on the water. I will say though that I find my oc1s to be significantly faster and more pleasant to paddle than my c1s. Fun thread, keep the info coming. This conversation brought on two other thoughts for me (yeah count them, two whole thoughts - a new Wally record). First, I had earlier mentioned that the safari boats would come in around #7 on my list. After some of the info brought up on this thread, I will have to say that assessment is probably wrong. After thinking about it I would guess that a fast safari boat would slot in at #2 or even a strong argument can be made that they should slot in at #1. The reason for my initial thought that they should fall in line at around #7 on my list is because I took into consideration their weight and used the thought that they are mostly built for blading. This thought/assumption is wrong. I had forgotten that many are made light (or at least as light as the "stock" canoes mentioned above). Also, I had forgotten that many are made to primarily canoe (they fell on my list due to my bad logic that there would be a big speed drop off going from double to single in a boat made for a double. You would not have that same drop off in a boat made primarily for a single- high seat for a better blade angle). Damn, I just laughed so hard, I almost peed my pants. My wife looked at the picture in this post and she said those boats remind her of herself. I looked at her with a perplexed look and said really, in what way? She said when we first met she was a DSX, after she had kids she was a Landick, and now she is a Spencer Extreme. That Mrs. Los Humungos is a funny one sometimes. AND never knew of the Rainmaker. Thanks for all the cool info and pics! Awesome stuff! A Crozier has to fit in there somewhere. It is at least a bit similar to the Landick II and Extreme. I'm not racing 2012 but maybe have to try out a Rainmaker before 2013. Thanks and keep 'em coming! Now lets upset things a little bit. If Johnson won the 2007 TWS in a surfski and the surfski is considered faster than those Texas boats, then how does a USCA fit in since Jerry Rayburn was only 1.5 hrs behind Johnson? THings to consider are 1. How technical is the course 2. Will paddling a boat like the USCA style force you to be a superior paddler and maximize hull speed on a technical course 3. Are "tippy" boats inherently slower on turns than a stabler platform 4. What about conditioning? 5. If all these boats are lined up with equal ability paddlers using only a single blade would the tippy boats with a lower seat throw off the mechanics of the single blader and result in a slower performance? Check out this scientific breakdown from Marek who has paddled 5/6 MR340s. He compares Kruger, Extreme and outrigger in a points system. Rivermiles Forum » Powered by YaBB 2.5 AE!